The book is a review of essential skills that an entry-level or experienced engineer must be able to demonstrate on a job interview and perform when hired. It will help engineers prepare for interviews by demonstrating application of basic principles to practical problems. Hiring managers will find the book useful because it defines a common ground between the student's academic background and the company's product or technology-specific needs, thereby allowing managers to minimize their risk when making hiring decisions. 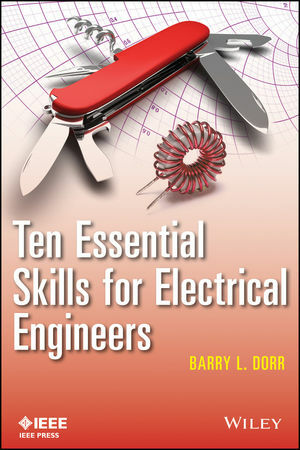 Ten Essential Skills contains a series of "How to" chapters. Each chapter realizes a goal, such as designing an active filter or designing a discrete servo. The primary value of these chapters, however, is that they apply engineering fundamentals to practical problems. The book is a handy reference for engineers in their first years on the job. BARRY L. DORR, PE, is a Principal Design Engineer at Datron World Communications. He has taught Circuit Analysis at San Diego State University, Servo Systems for the IEEE, and numerous industrial seminars. He holds eight patents for signal processing and communication devices, and has contributed articles to Embedded Computing Magazine, Electronic Design News, and various trade publications.